The frustrating thing is, time spent on (promotion) strategies would detract from time spent doing my job, writing content for my clients. It feels like we are focusing more on the pot of gold, not the rainbow. As a writer, do you feel the same way? My take is that organizations need to look at how the team as a whole is spending its time to make sure there is ample time to promote. And the person who commented on LinkedIn is also right that writers need to spend most of their time writing. But, there are things writers and editors can do to extend the reach of the content they have spent so much time and passion creating. In fact, this was the focus of a recent internal lunch-and-learn presentation that CMI Community Manager Monina Wagner and I put together. The tips were helpful to the companywide UBM team, and we wanted to share them here as well. These ideas aren’t meant to be comprehensive of everything an organization can do to extend its reach. Rather, these are all things writers can do on their own or with the help of another team member (such as a designer or web person). We did not talk about things like email or paid promotions, which are valid ways to extend your reach as well. The list below is practical – and, perhaps even better, everything on this list does not require any budget asks. This tip – as well as many of the others below – is about extending the reach of your best content. How do you know what your best content is? You can read about the key reports and the process I follow in Google Analytics to determine what content we want to prioritize for sharing. 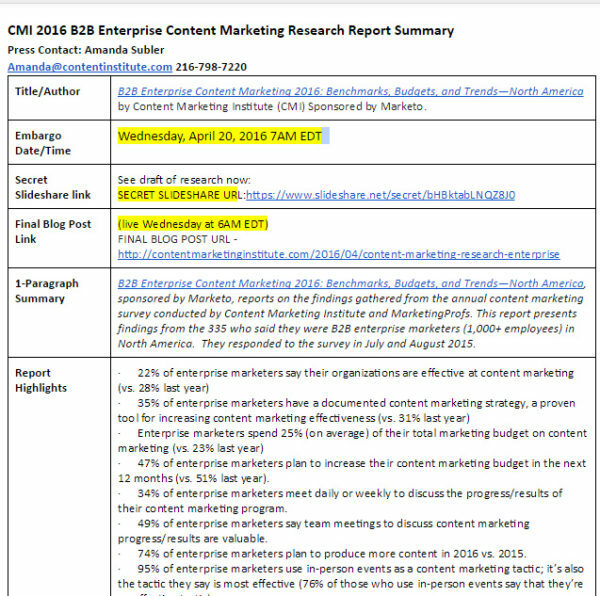 And, if you want to get yourself even more organized, use these insights to come up with your content essentials checklist. We all spend so much time on our websites with the production of new content, it only makes sense to get as much from that time – and traffic – as possible. This first set of ideas covers how to do just that. We’ve been using Clicks to Tweet in our blog posts for the past 18 to 24 months and have loved the results. As a writer, I anecdotally see my posts being shared on Twitter with those Click to Tweet statements. Consider how many tweets you want to use per post. We typically include two to four. Keep the Click to Tweet text to approximately 110 characters to provide ample space for the URL as well as retweets. Include relevant hashtags and Twitter handles of authors as well as those mentioned in the text. Review the stats from your Clicks to Tweet to see what is being shared. For instance, we find that tweets with stats and short, impact statements do best. Often, the first Click to Tweet in a post does well. TOOL SUGGESTION: We use Better Click to Tweet, but there are several options available. Have great posts you want to share more widely? Include them in your new posts. We have tried various formats, and here are two that work well. Like all blogs, we embed links within our posts to related content. Our general rule of thumb is to only include links that provide additional information to a reader when it would be helpful. We do not want to include a link simply for the sake of adding a backlink. While adding links to great posts as you continue to publish may be somewhat obvious, remember that you can add links to older posts as well. Andy Crestodina shared that Orbit Media always adds a link to a new post from an old post as part of the publication process. This is a fantastic idea! Even if you don’t go that far, consider how you can get traffic to your best content. For instance, whenever we publish an e-book, the author sends a list of updates for our web person to make, including updated links and existing articles, as well as updated calls to action on related posts. For instance, here is a snippet from an email that covers some of the changes to make when we published a new influencer marketing e-book. Another simple thing to include on your website is a popular-post widget that makes it easy for readers to browse your best posts. If you work with outside writers, this is also a great place to point people when they want to see some examples. TOOL SUGGESTION: The popular-post widget we use is WP Tab Widget by MyThemeShop. Another thing you can do to organically extend the reach of your content is to make sure you have a taxonomy in place, which often manifests itself as your website categories and tags. This is a work in progress at CMI, and we are doing a lot of work on the back end that is not yet visible. The goal is to help our readers surface related content through breadcrumb trails or other pages – and extend the reach of what we have. Lisa Dougherty, who manages our blog, is a master of personal outreach. Each of the following ideas is taken directly from how she works with authors – those mentioned in our posts, as well as team members. Lisa also follows up with each author after the first comment on the blog as a reminder when the post is live – and the author can easily refer to this message for sharing ideas. TOOL SUGGESTION: Lisa uses Outlook’s Quick Parts to make templates for emails that are sent repeatedly. Google Mail has a Lab that has a similar functionality called Canned Responses. Both tools can be customized easily. You also could send this after the piece is published. See what works best for you and your authors. This badge not only shows appreciation for your authors, but it also recirculates your best post. People love awards like this and often share them and/or post them as badges on their website or LinkedIn profiles. And, as a side benefit, it also gently reminds your best authors to write for you again. 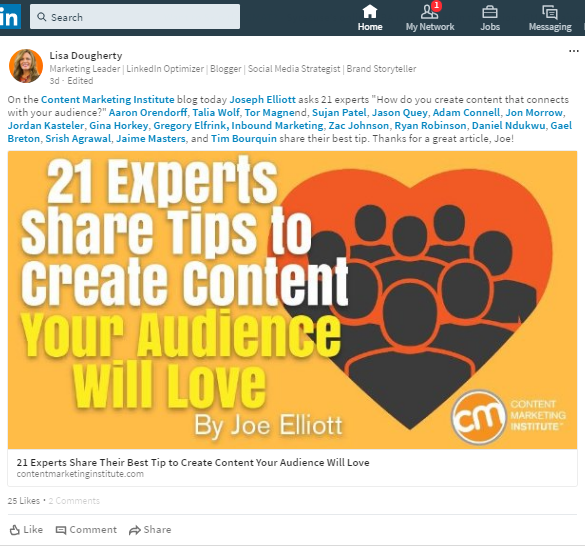 Another tactic Lisa uses to show our appreciation for our contributors and extend the reach of our posts is to share each post over several months on multiple social platforms like LinkedIn, Facebook, Twitter, and Instagram. For example, on LinkedIn, mention contributors by name with the @ symbol to increase post visibility. This example had 851 views for 15 minutes of Lisa’s time. 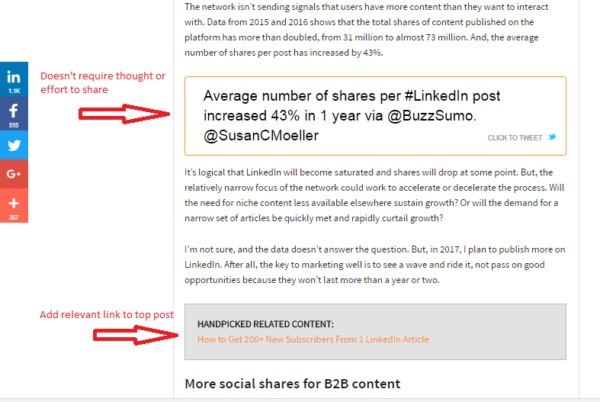 TIP: Long-form content is shared more than short posts on LinkedIn. Another easy thing to do is to include your best posts – or the best posts from your company – in your email signature. Here is an example from Lisa’s email that includes a post that she has written as well as a list of our top posts from 2016. In addition to asking contributors to share their posts – and making it as easy for them as possible – we do the same thing for our team members. Lisa is fantastic about reaching out to team members with occasional, specific asks. For instance, she’ll send me a chat message to ask me to share a specific article on Twitter or LinkedIn. As someone who can have tunnel vision, I appreciate how easy she makes this – and I’ll always share what she is asking. While shooting an email or making a request to the entire team can also work well, I am partial to one-to-one asks because you don’t see a flood of people from the team all sending the same set of tweets (although that can be effective). This next set of tips extends the reach of some of your best content by publishing it again. I’ll be honest: Our team had several conversations on the validity of the bring-back approach, but I’m glad we tried it – and the results have been surprisingly good. Our Back by Popular Demand posts are often some of our top-performing posts for the month. We republish posts with substantial updates as well as those with few or no updates. In general, the results are equally good. 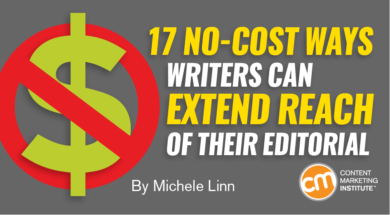 All republished posts are called out as such through an editor’s note as well as an image that includes the Back by Popular Demand branding. We wait about a year to republish our posts. We look at organic search traffic to decide which posts to handle. As mentioned in the tip above, use Google Analytics to see which links are getting clicked on and update the post using that data. Remove the links that people aren’t clicking on and update the post with better information whenever possible. Do you have articles in print whose life you can extend by publishing them digitally? At CMI, we have CCO magazine, and we republish many of the articles on our blog with a call to action encouraging readers to subscribe to the print version. I also send monthly editorial updates to the team using this process and template. However, I’ll share a quick story that may help simplify things: The end-of-the year holidays hit and I got busy. I dropped the team update from my to-do list and thought no one would notice – but several people asked about it. It was a great way to follow up and ask what was most useful about that report. Every person told me the slide on top posts was what they cared about the most. How does the team use this info – and how does it help us extend our reach? Here is one example. I moderated a webinar in April with Aaron Orendorff. 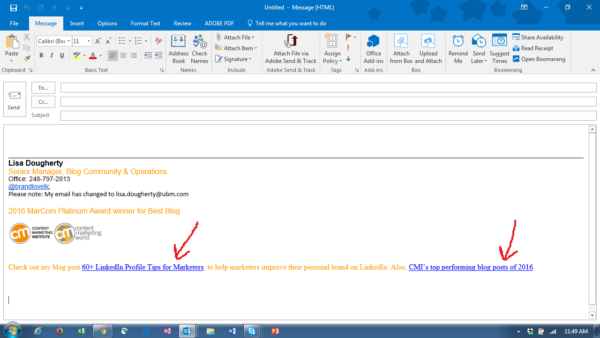 He had written a post about building your email list we published in September 2015. It did so well, we brought it back by popular demand in September 2016. That piece also performed fantastically, made this top-performing list, and we reached out to Aaron to present that same topic in April. That’s a lot of exposure that sprang from one post! And that would not have happened had the team not shared what was working well. Content and social media are intersecting more and more frequently. This is no surprise to those on the front lines (like community managers) because they increasingly see the need for closer collaboration. Quality content is the key to any successful social media strategy. Users who find content interesting, unique, and informative freely share it on their social channels, leading to higher engagement for the brand. In turn, analyzing that engagement can inform marketers on how their content is resonating with their target audience. It’s a cyclical relationship – informing and depending on each other. At CMI, we employ four tactics to help us extend our reach. The first tactic is to curate. The way businesses do social isn’t much like the way consumers use social. Yes, our content appears on Facebook, but we use scheduling dashboards, link-shorten tools, image templates, and a lot of tools that the average person doesn’t use. We’re scheduling content well in advance at a much higher volume than most people realize (often dozens of posts per day). 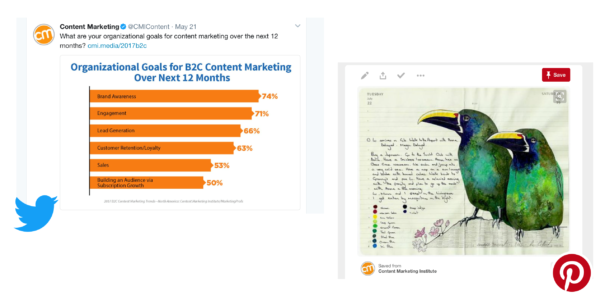 In fact, when CoSchedule, a curating and publishing app, researched the idea of sharing content more than once on social media, it found it can increase clicks by over 3,000%. 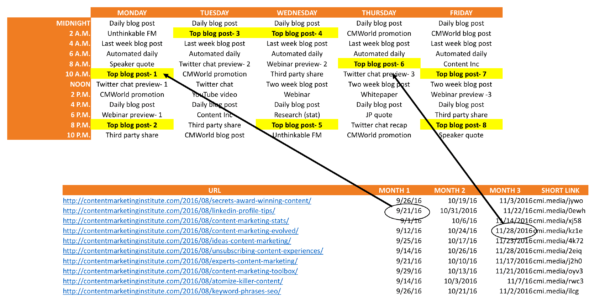 Our social media content calendar organizes how we curate content. We keep it simple and straightforward. 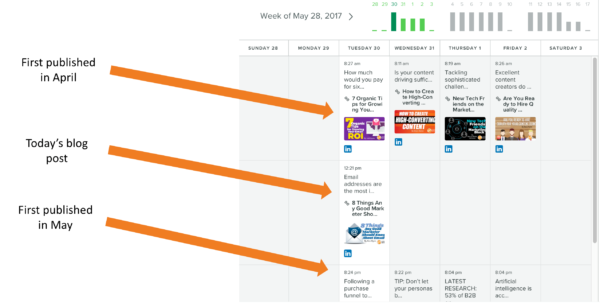 Our calendar guarantees that our audience will not hear the same message at the same time across all channels. For example, on the day of publishing, we craft three to five separate tweets that we’ll publish at different times. Here, we post content from our blog on LinkedIn three times a day. These blog posts include items first published at least two months prior. This maximizes attention brought to the post and increases the chances of traffic to the website. Our social media calendar also ties back in with the best posts that are shared each month. Once Monina, our community manager, receives the top-performing posts for a certain month, she adds them to a spreadsheet because we want to leverage popular posts as much as we can while they are relevant. This is where we can assign specific dates throughout the next three months to make sure they get play in our calendar. Social media has historically been used for sending traffic to your blog, but a relatively new trend is people reading your content on social media itself. How do you use this trend and still promote your blog? By repurposing your blog post into social media content and linking to the original source. You can do this by creating assets in several formats. Visuals have high viral potential. Images attract more attention in the news feed, and they can be shared more than any other type of content. Quotes can be more effective than just including the title of your blog on an image. For example, we tweet a title and the blog post link as text and include an image with an interesting quote from the post, too. In addition to quotes, we pull charts from our research reports and add a question to engage audiences. Or we pull an image featuring a content marketing example. A link to the corresponding blog post or report is included with each of the images. Our third social media tactic for sharing content is not sharing our content but more supporting our community’s content. Specifically, we look to leverage the influencers. They can be existing community members, speakers, or sponsors. Think of it as building relationships so that when your brand – and content – comes up, they are more willing to listen. Getting on an influencer’s radar is not easy, so we often share pieces of content written by our influencers that would be of interest to our community. When we share their content, they often notice it. 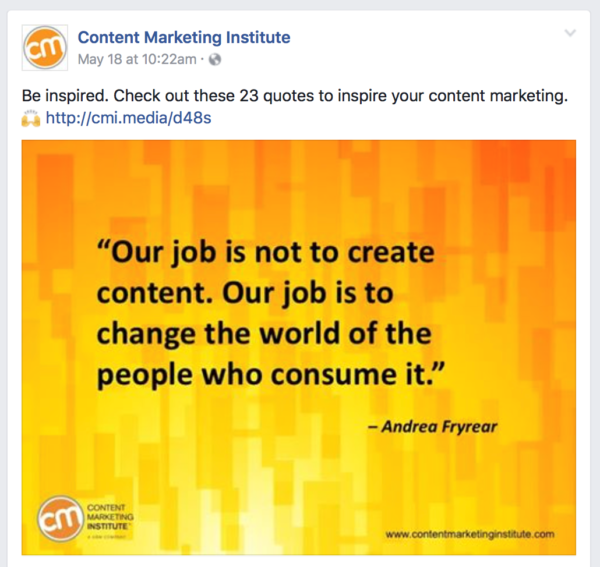 And this encourages them to say “thank you” with a share of CMI’s content. 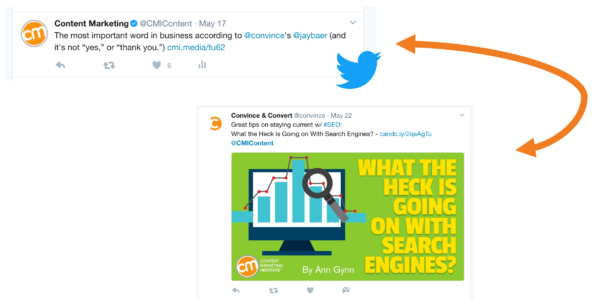 To track what our influencers are creating, CMI frequently uses its Twitter lists that are organized by categories of influencers, such as speakers, sponsors, blog contributors, and CMI Twitter Chat participants. 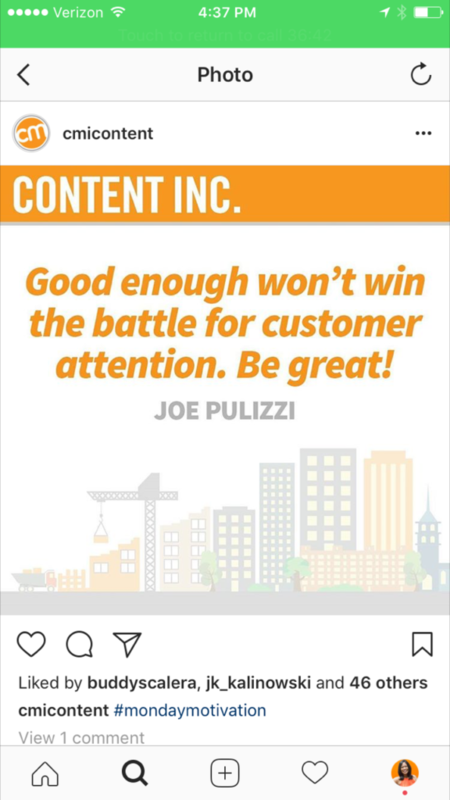 Here, we share content from Jay Baer, a Content Marketing World speaker and friend of CMI. 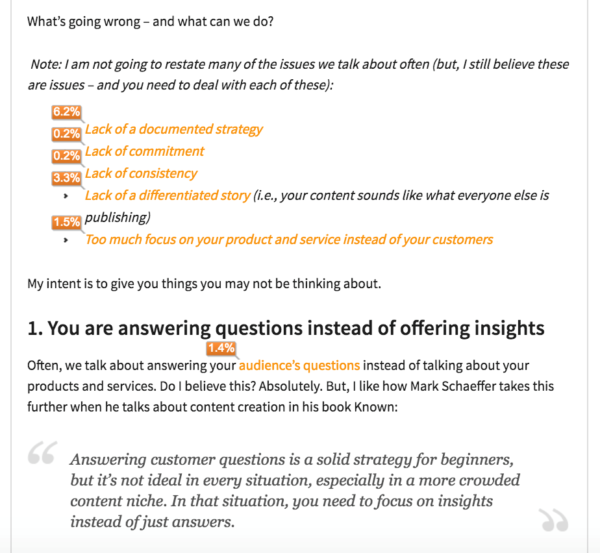 A few days later, Jay’s company, Convince and Convert, shared an article from our blog. One trick to consider is using social-media listening to see who’s sharing your content and where they’re doing it. We monitor not just “@” mentions but also keywords and general conversations. It helps us stay in tune with what our audience is talking about and foster a community so they are more apt to share our content. CMI is the first to know when someone needs to take sick leave and we know who their favorite sports teams are. 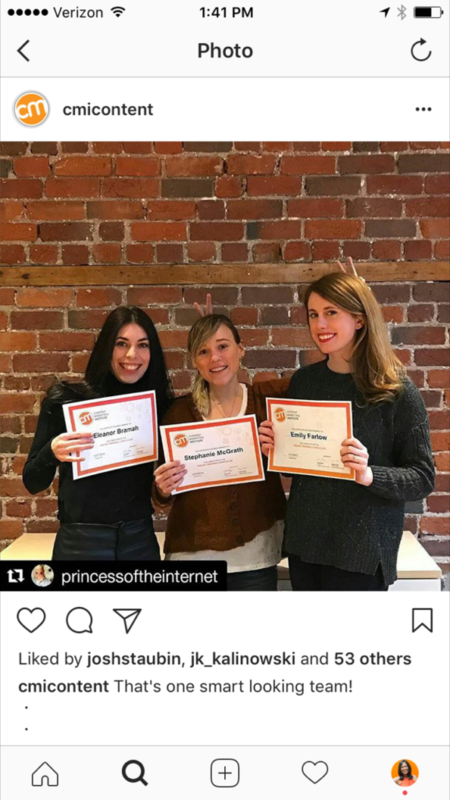 We know when they’ve graduated from Content Marketing University or when they’re excited for our events. Think of it as seeing what your audience’s lives look like – professionally and personally. Engage with them in a genuine way, even if it doesn’t have to do with a project you are working on. Forming this relationship with them leads to advocacy for your brand – and your content. Our last tactic is to discover what the media is up to. You can follow trending news and industry topics to see how your content may be a fit. At CMI, we follow top reporters from outlets where we’d like to get coverage. When we realize a reporter is talking about a topic we have intel on, we can reach out to them. Social media is also great when pitching your content. Here we let reporters know about our latest research. Also, just as you can with influencers, you can form a relationship with reporters via social media. Be on top of what’s happening with them and let them know you’re listening. When you know what they’re talking about, they’ll remember that the next time you call them with a pitch. 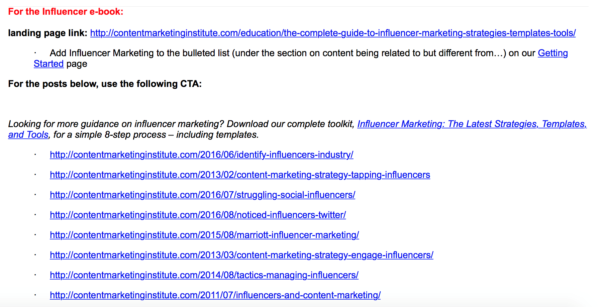 For each research report, we put together a targeted Google spreadsheet of influencers who might be interested in the report (you can download and customize this template). We pull the names from our substantial network of CMI bloggers, Content Marketing World speakers, Content Marketing Awards judges, and influencers who are friends of CMI. For our research, we create a one- to two-page reference guide, which is a cheat sheet of all the information we plan to include in a press release about the research. This information includes: title of the research, a one-paragraph research summary, and other pertinent information. The goal is to make life as easy as possible for bloggers or journalists to increase the chance they will write about us. 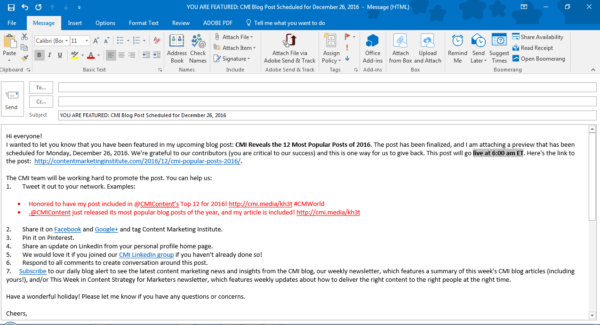 While we suspect you already have been using some of these ideas to extend the reach of your content, we hope you picked up some new ideas as well. And we’d love to learn from you – what other ways can writers get the word out about their content? 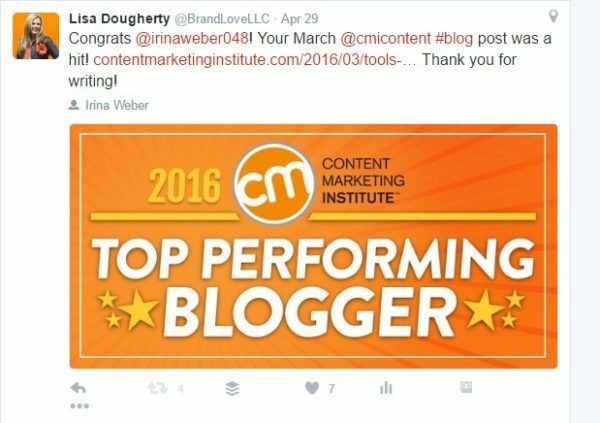 Editor’s note: CMI Community Manager Monina Wagner and Senior Blog Manager Lisa Dougherty contributed to this post. Subscribe to CMI’s daily newsletter for more tips, plus trends, insight, and more on content marketing.